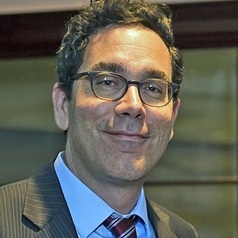 Gavriel D. Rosenfeld is Professor of History and Director of the Undergraduate Program in Judaic Studies at Fairfield University. He received his B.A. in History and Judaic Studies from Brown University in 1989 and his Ph.D. in History from UCLA in 1996. His area of specialization is the history and memory of Nazi Germany and the Holocaust. He has written a wide range of books, including Hi Hitler! How the Nazi Past is Being Normalized in Contemporary Culture (Cambridge, UK: Cambridge University Press, 2015) and the edited collection, What Ifs of Jewish History: From Abraham to Zionism (Cambridge, UK: Cambridge University Press, 2016). He is also the author of Building after Auschwitz: Jewish Architecture and the Memory of the Holocaust (New Haven: Yale University Press, 2011), The World Hitler Never Made: Alternate History and the Memory of Nazism (Cambridge, UK: Cambridge University Press, 2005), Munich and Memory: Architecture, Monuments and the Legacy of the Third Reich (Berkeley: University of California Press, 2000), and the co-edited work, Beyond Berlin: Twelve German Cities Confront the Nazi Past (Ann Arbor: University of Michigan Press, 2008). He has also written numerous articles, which have appeared in such journals as Central European History, History and Memory, Holocaust and Genocide Studies, German Politics and Society, The Journal of Modern History, History and Theory, The Journal of Contemporary History, and The Jewish Quarterly Review. He is a frequent contributor to the Forward newspaper and has published opinion pieces in The Washington Post, The San Francisco Chronicle, and the Hartford Courant. He edits the blog The Counterfactual History Review.